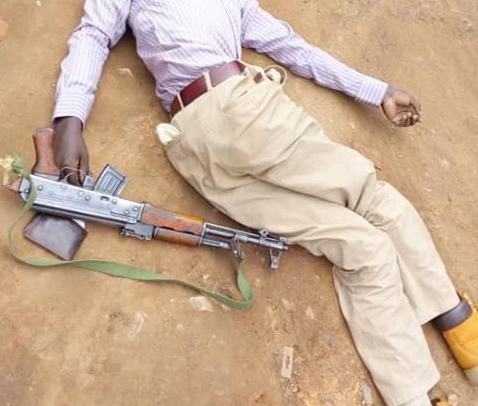 MBARARA – Security forces from the Flying Squad Unit have made a joint operation in Mbarara and gunned down a serial robber who has been terrorizing residents of Bushenyi and Rwizi regions. Mr. Samson Kasasira, the Rwizi region police spokesperson, has identified the suspected robber as Yonathan Mbaine, 40 a born of Bushenyi. The suspect was gunned down in Nyakaizi Cell, Kakoba Division in Mbarara Municipality. Mr. Kasasira revealed that Mbaine and others who are still on the run, on March 4, 2019, attacked Bam Petrol station in Kabwohe where they robbed over UGX26m on gunpoint. They later took off on motorcycle Reg. No UEB 527V. “These thugs today were ably tracked by the flying squad and Mbaine was gunned down. An SMG riffle UG PSO 340235607221 with two rounds of ammunition was also recovered,” Mr. Kasasira confirmed. He said that others who were arrested are Abbey Nyonyintono, Patrick Kato and Hussein Odeke who have been transferred to Kabwohe where the offense was committed. Mr. Kasasira said that the body of Mbaine was taken to Mbarara Regional Referral Hospital mortuary for post-mortem as investigations continue to crack down the gang.